Expanded, updated, and more relevant than ever, the bestselling business classic by two internationally renowned management theorists shows how companies of any size in any industry can seize opportunities in the post-bubble economy. Lean Thinking begins by helping listeners to identify value, asking, 'What does the customer really want?' instead of 'What can we try to convince the customer to accept?' Lean thinkers then identify the value stream -- every step required to move a specific good or service from initial concept into the hands of the customer -- for each product and ask if each step really creates value. Those that don't -- the great majority -- are then removed, and the remaining steps are conducted in continuous flow at the pull of the customer, as the firm manages toward perfection. As a consequence, lead times, costs of all sorts, and defects shrink, while responsiveness to customer needs and selling prices increase. In an economic downturn, many companies are searching desperately for a sustainable formula for renewed growth and success. Lean Thinking is that formula -- a proven blueprint and specific action plan that will help any company stabilize its position and grow steadily while better serving its customers, employees, suppliers, and investors. This is an outstanding introduction to lean. Our company practices lean and this was a great addition to the concepts I have already learned. 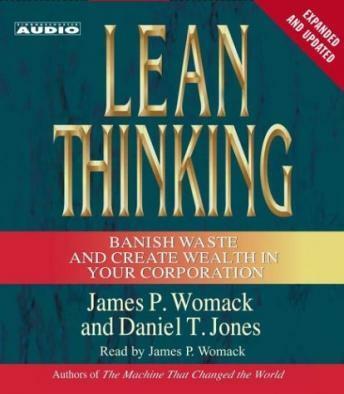 This book should be read/listened to by anyone that is going to put lean into practice. I've recommended this book to 4 people at our company in the last 2 weeks, so it's a winner! Perhaps the unabridged version would have been better, but this 2 hour version was too lean to get a true appreciation and understanding of the Lean Thinking principles. Furthermore, while the principles could, in theory, be applied to various industries, all the examples, case studies and statistics presented are from manufacturing companies (which I personally do not care about).